Below is the press release from one of the presenters at InterSolar North America in San Francisco, CA in July 8-10, 2014. Miramar, FL – May, 2014 – CITEL, the leader in photovoltaic surge protective devices, is excited to announce that their 2016-ready SPD’s will be featured at Intersolar North America this July. “We are excited to show the solar community our surge protective devices at Intersolar 2014.” said Patrick Coyle, VP of CITEL, “Our SPD’s have been specifically engineered to meet the protection needs of PV systems and ready for the UL updates in 2016.” CITEL continues to lead the way in the solar industry by developing innovative surge protection solutions specifically for photovoltaic applications now reaching up to 1500 vdc. By their remote nature, Photovoltaic (PV) systems are highly exposed and vulnerable to lightning induced power surges. A PV system that is not equipped with surge protection can be severely damaged or even destroyed in the case of an over voltage such as one that would be caused by a lightning strike. Not only are the panels themselves targets for lightning, so are inverters, combiner boxes, feeder lines, structural supports, and even data lines throughout the system. The risk is so high that international standards have been written specifying the type and locations of SPD’s in a PV installation. A full surge risk assessment is an important step when installing a PV system, in order to identify any safety requirements. Surge protective devices are essential in order to achieve the ROI that fully operating PV systems are designed to provide. SPD’s provide reassurance that the system will be protected in the lightning-prone environment in which it is placed, thus protecting the investment and avoiding costly downtime, repairs, and replacements. It is essential that anybody considering a PV installation also incorporates the protection of an SPD. The DS60 and DS50 family of SPD’s are also 2016-ready. By 2016, all UL1449 3rd Edition SPD’s will be required to test and publish a short circuit current rating (SCCR) and pass the intermediate current tests in order to comply with more stringent SPD component assembly standard. The DS60 and DS50 products also have the option to feature CITEL’s patented VG Technology. VG Technology provides the key benefits of increased life expectancy, elimination of leakage current, elimination of working current, and will meet the most stringent UL standards with no conditions of acceptability. CITEL is an ISO-9001 company that designs SPD’s to the leading international standards including; UL1449, UL497A, UL497B, UL497E, UL1283, IEC-61643, CSA, VDE, NF, and GOST. About Intersolar North America: Intersolar North America takes place annually in San Francisco’s Moscone Center. Since its establishment in 2008, the exhibition and conference have developed into the premier platform for the solar industry in North America. The exhibition focuses on the areas of photovoltaics, PV production technologies, energy storage and solar thermal technologies. 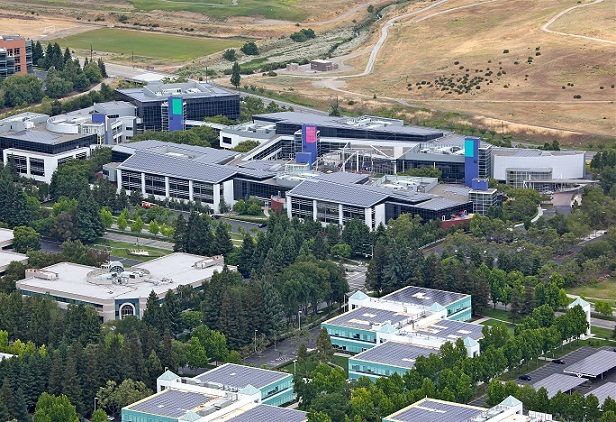 It is co-located with SEMICON West and, since its founding, has become the international industry’s meeting point for manufacturers, suppliers, distributors, service providers and partners of the solar industry. Spanish company Grupo Clavijo has begun supplying horizontal single-axis trackers for the Chañares project, an 40 MW installation in the Chilean region of Atacama, with Greenwood Biosar Chile Spa (Aktor Group) acting as the main EPC contractor. Clavijo also is announcing the opening of an office in Santiago de Chile, to be led by sales manager Cristina Clavijo. The horizontal single-axis trackers used in this installation feature high performance, robustness, simplicity and quick assembly. Adaptable to all terrain types, they support multiple configurations and monitoring options. They are currently among the most advanced horizontal single-axis trackers on the market worldwide, having already been installed by Clavijo in Eilat (Israel), Hanford and Fairfield (USA), Zuera (Spain) and the Halutziot project (Israel). This project, paired with the new office, will consolidate Grupo Clavijo’s presence in Chile and will drive the development of photovoltaic projects in the country. Grupo Clavijo specialises in the design, manufacture, installation and maintenance of the most extensive range of photovoltaic structures and solar trackers on the market. 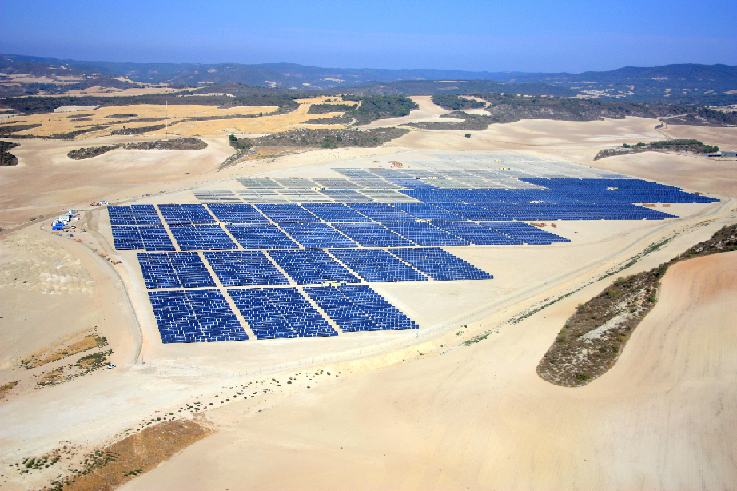 With more than 480 MW installed worldwide, it is a benchmark for developers, installers and EPC contractors of photovoltaic projects around the world. ANSI/IREC Standard 14732:2014 Is Here! June 20, 2014 – A new national standard for the accreditation of clean energy education/training certificate programs, developed by the Interstate Renewable Energy Council (IREC), has received final approval from the American National Standards Institute (ANSI) as an American National Standard. 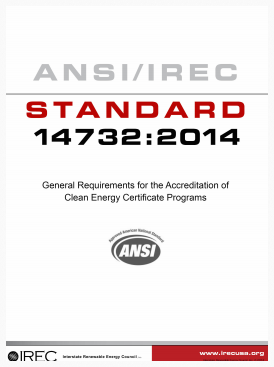 IREC was accredited by ANSI in 2013 as a standards developing organization, leading the nation in clean energy education/training credentials and standards. ANSI/IREC Standard 14732-2014 was developed by an independent, subject matter expert working group of the IREC Standards Committee, working closely with industry leaders so that the standard is aligned with specific job task analysis, and linked to real-world skills needed by individuals entering the clean energy workforce. Certificate programs that apply for accreditation under the standard may be hosted by a variety of institutions, including colleges, industry training groups, for-profit organizations, or unions. The IREC Standards Committee and the working groups who develop and revise IREC’s standards help to ensure industry validation and acceptance. For questions about IREC’s standards development activities: credentialing@irecusa.org, or call (518) 621-7379. Have you ever heard of Barclays? Barclays is a British multinational banking and financial services company headquartered in London. It is a universal bank with operations in retail, wholesale and investment banking, as well as wealth management, mortgage lending and credit cards. It has operations in over 50 countries and territories and has around 48 million customers. As of 31 December 2011 Barclays had total assets of US$2.42 trillion, the seventh-largest of any bank worldwide. This PLC (public limited company) organization has been around since 1690, obviously with plenty of experience in observing and forecasting trends of various types. Over the next few years… we believe that a confluence of declining cost trends in distributed solar photovoltaic (PV) power generation and residential-scale power storage is likely to disrupt the status quo. Based on our analysis, the cost of solar + storage for residential consumers of electricity is already competitive with the price of utility grid power in Hawaii. Of the other major markets, California could follow in 2017, New York and Arizona in 2018, and many other states soon after. In the 100-plus year history of the electric utility industry, there has never before been a truly cost-competitive substitute available for grid power. We believe that solar + storage could reconfigure the organisation and regulation of the electric power business over the coming decade. Some of you out there may have previously come across another recent report, The Economics of Grid Defection, with similar language or logic, by the Rocky Mountain Institute (RMI). RMI was forecasting the declining costs of solar plus storage and the soon-to-arrive days when when those systems could reach parity with grid-sourced retail price electricity in a growing number of markets, including Hawaii, California, and New York. In fact, the Barclays report cites RMI as a key source in several of its analyses that lead to this conclusion. Barclays believes we’re entering a post-monopoly world in which distributed energy resources will take place alongside large-scale central generation as a critical energy resource and a widely available and affordable customer option. In a surprisingly strong prediction for analysts, Barclays views this transition as inevitable: “Whatever roadblocks utilities try to toss up—and there’s already been plenty of tossing in the states most vulnerable to solar, further evidence of the pressures they’re facing—it’s already too late.” A downgrade suggests two possible outcomes in the near future: 1) analysts tend to move in herds, so expect more news on the U.S. electric sector soon, and 2) capital is likely to get a bit more expensive for utilities, as millions of dollars shift out of the sector. It’s not all bad news, as indicated recently in “Caveat Investor,” this should ultimately lead to a stronger, more resilient power sector with stronger overall valuations, but the transition is likely to be volatile. The Barclays report suggests we’re about to enter that volatile transition phase. 1) Distributed energy is hitting the mainstream. Historically, it’s renewables’ creditworthiness that has been challenged (while utilities have been considered rock solid), but now this trend appears to be reversing. We’ve seen declining costs of capital in solar (as recent securitizations demonstrate), new financial instruments emerging for related technologies, and lower costs overall. Despite this progress, there is still a large gap between the market acceptance of renewables and the market acceptance of central, fossil-fueled generation. The recent downgrade suggests that people are starting to take distributed renewables seriously, and that utilities and renewables are entering a period of equal (or at least comparable) market strength. 2) Issuing new bonds for thermal fossil generation will become more expensive. While many people focus on the construction costs of new assets (central and distributed generation alike), it’s more often the cost of capital that determines project viability. Traditionally, utilities have almost always been the lowest-cost provider of new energy resources, and part of this advantage has rested on ready access to and favorable terms from the bond market. If that advantage is eroding, then expect new players to be able to compete for providing the nation’s energy, including providers of much smaller, distributed generation. 3) Distributed storage, when combined with already mature trends in generation and energy efficiency, compounds the disruptive threat of consumer-scale investments in energy. Many people have worried that declining demand (through energy efficiency) and distributed generation are putting enormous stress on the traditional business model for investments in central generation. That has not changed at all. So why does the emergence of storage, something that doesn’t reduce consumption or increase generation, suddenly give the markets concern? Simply put, the addition of storage gives customers the option to entirely disengage from their relationship with the utility. While most customers won’t choose to leave, and for good reasons, the threat of grid defection creates consumer leverage that will slow recent upward trends in utility rates out of competitive necessity. 4) These trends are likely to accelerate. As capital shifts from central to distributed generation, this just improves the economics of distributed resources even further, through scale benefits as well as lower cost of capital. Few people would say that we’ve even come close to market saturation for any customer segment for renewables and efficiency. As the traditional electric sector becomes a more challenging place to park capital (or even just a less certain place), more investors will start to notice that investments in distributed resources have similar risk-reward profiles, and this movement of capital will be self-reinforcing. Distributed generation is likely to be an affordable and accessible choice for more and more customers alongside traditional utility-provided electricity. More options means more competition and increased relevance of the customer. And that’s an upgrade for users of electricity everywhere. Perhaps this is also a time of warning for the U.S. utilities to take action in making greater effort in encouraging environment that would help to provide incentives for consumers to stay on the grid rather than defecting from the grid. On this topic, please feel free to refer to one of our earlier posts, In-Depth Analysis of Renewable Energy Policy With Toby D. Couture.